Wolf Creek Trout Lily Preserve is a 140 acre conservation area owned by Grady County thru many generous private donations, including the previous owners, Flint River Timber Company, and a grant from the Georgia Land Conservation Program. 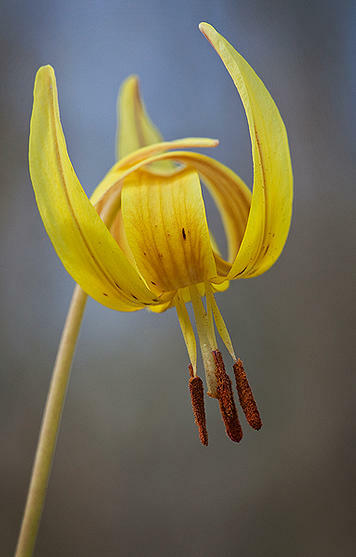 Established in 2009 through the efforts of volunteers from the Magnolia Chapter (Tallahassee) of the Florida Native Plant Society (including some Georgians), it is destined to remain forever undisturbed from human development, protecting the many acres and literally tens of millions of beautiful yellow and maroon dimpled trout lilies and thousands of maroon spotted trillium. 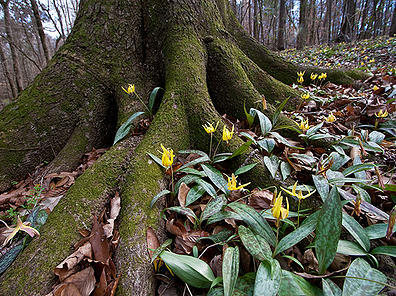 This is the largest extent of these trout lilies known anywhere in the world, and certainly a jewel of Grady County! 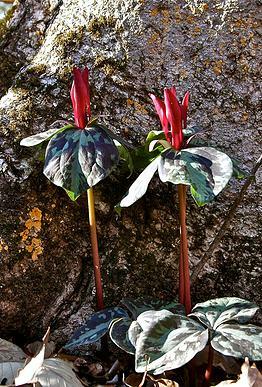 How did these plants come to be there? They are usually found in the Appalachian mountains. The theory is that they migrated from the mountains probably tens of thousands of years ago. When the last ice age receded they were left in some spots in southwest Georgia and north Florida, east of the Chattahoochee, Flint, and Apalachicola Rivers. Apparently the Wolf Creek spot is just right for them - a north facing slope of just the right angle, a hardwood forest with dappled sunlight in the winter, soils of just the right type and depth before underlying clay. Whatever the reasons, they prospered at the site, and Grady County is blessed with a beautiful marvel for all lovers of nature! It is definitely a photographer's paradise!